Thats a cool concept,I like it. It would have been better if the weapon was not recolored to balck,good unit none the less. This new unit by dontstayafk adds a unit that looks like the Grim Reaper into your editor. This unit is a very unique concept and can have many uses for those with a creative eye. It can be used as a personification of death in a scenario where the hero is on the edge of death, or as a demon in a horror themed scenario. It is something that has not been seen before in AOK and therefore I award it a good score in this category. Unfortunately, there is no team colour for the unit and the anchors are not set properly, which makes the unit jump around a bit. It also comes with a custom icon. 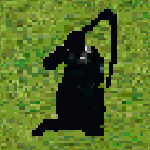 The unit is a recolour of a farmer unit, with the scythe extended into a weapon to match that of the Grim Reaper's. While the recolour fits the purpose of the unit, it also looks a bit unrealistic due to being one single shade of black and therefore looks a bit odd and bland. Adding in some shading would go a long way to make this unit look realistic. Overall a nice little unit with some good uses but lacks the quality to make it really worth the download, unless it totally serves the purpose you need. Well Done, a good start and attempt. Thanks for the review. I am glad if this unit helps. Unfortunately when I created it, I did not know how to export the BMP with "Fixed Canva Size", if I knew it it would not be all out of place. It was edited with paint, based on the Farmer unit, for the Legion mod.